President Rodrigo Duterte scored yet another legal victory after the Supreme Court (SC) ruled in favor of his declaration to put the entire island of Mindanao under Martial Law after ISIS-linked terrorists tried to invade the Islamic city of Marawi. Last year, SC also ruled the legality of President Duterte's decision to allow the late dictator Ferdinand Marco's burial at the Libingan ng mga Bayani. 11 justices voted to dismiss the consolidated petitions while three magistrates--Chief Justice Maria Lourdes Sereno, Senior Associate Justice Antonio Carpio and Associate Justice Alfredo Benjamin Caguioa--believe the coverage of martial rule should be limited to some areas only. Only Associate Justice Marvic Leonen voted for the junking of martial law. Surprise! What can you expect from this Dilawan minion? 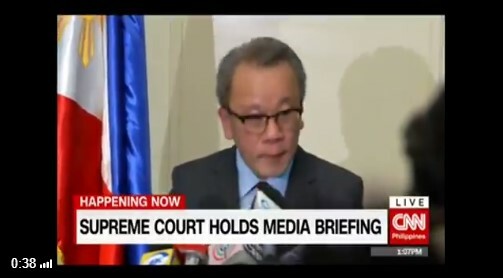 SC spokesperson Theodore Te did not divulge the basis for the Court's decision. Supreme Court, being the highest court in the Philippines, is the final arbiter and has the final say on legal matters. According to a GMA News report, "The SC heard the consolidated petitions filed by a group of opposition congressmen led by Albay Rep. Edcel Lagman, activists and militant lawmakers, and four women residents of Marawi City - the site of vicious fighting between government troops and Maute group since May 23. The petitioners and the Office of Solicitor General were given the chance to defend their positions in three-day oral arguments that ended with a closed-door briefing by Defense Secretary Delfin Lorenzana and Armed Forces chief General Eduardo Año on June 15. For the petitioners, the armed conflict in Marawi did not necessarily call for the imposition of martial law. They pointed out that terrorism does not equate to rebellion, noting that the attacks on Marawi City stemmed from an armed resistance by the Maute group to shield Abu Sayyaf leader and ISIS emir for Southeast Asia Isnilon Hapilon from capture. Dramatizing their call for an end to martial rule, activist groups led by Bagong Alyansang Makabayan even staged a picket outside the SC ahead of Tuesday's vote." Government counsels argued that putting Mindanao under martial rule was imperative to contain the terrorists since ISIS-linked local rebel groups have taken arms against the Philippine government to remove Mindanao from the republic and to deprive Duterte of his powers and prerogatives. Duterte had said he would abide by the high tribunal's decision even as he vowed last Saturday to only listen to recommendations from the armed forces on whether to lift the martial rule or not. "It's not dependent on the whim of the Supreme Court. Should I believe them? When I see the situation is still chaotic and you ask me to lift it? I will arrest you and put you behind bars," Duterte said in a speech before local officials. "We can talk of anything else and make compromises maybe but not when the interest of my country is at stake," he added. More than 400 people, mostly militants, have been killed and nearly 400,000 people have been displaced by the ongoing conflict.